When Nehemiah heard about the devastation in Jerusalem, the first thing he did was a very good thing: “I sat down and wept, and mourned for many days; I was fasting and praying before the God of heaven” (Nehemiah 1:4). Godly leaders identify themselves with their people; they don’t think of themselves more highly nor look down on others. Nehemiah said in his prayer, “BOTH my father’s house and I have sinned. WE have acted corruptly against You” (vv. 6, 7). Given the fact that this is 70 years after Judah went into captivity, it is doubtful that Nehemiah was captured in Jerusalem, but he was probably born in exile. Yet he said WE sinned against God. He also asks God to “be attentive to the prayer of Your servant, AND to the prayer of Your servantS” (v. 11). Once again Nehemiah identifies himself with all the people by not claiming that his prayer carries any more weight than anyone else’s prayer. Every prayer, in Nehemiah’s mind, was equally as pleasant to God’s ears. 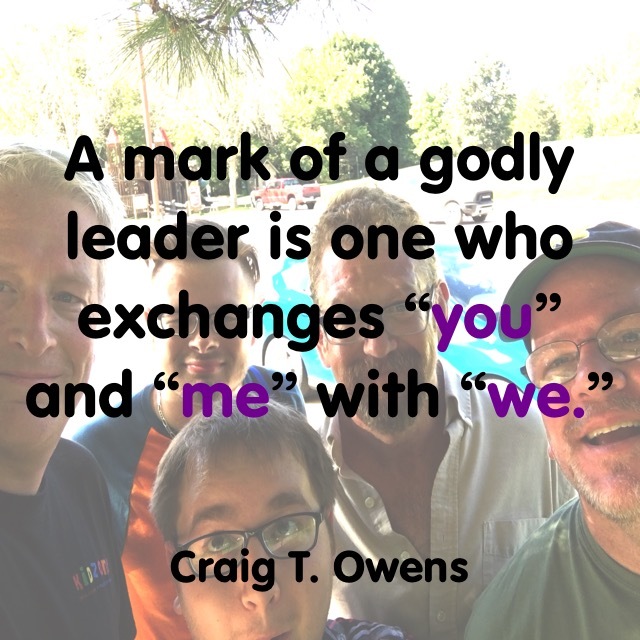 My prayer—Help me to be a “we” leader. This is Part 23 in my series on godly leadership. To read my other posts, please click here.